The planet Venus should be a dazzling object in the night sky of 2015. Here's how to see the bright planet in the night sky this year. Venus is visible in the southwestern sky just after sunset. Currently hovering very low in the southwest twilight sky near the setting sun these evenings is the most brilliant of the planets: Venus. And in the New Year, this planet will truly shine. Venus, Earth's sister planet and nearest planetary neighbor, travels in a nearly perfect circle as it orbits the sun. This means the Venus circles the sun 13 times over eight Earth years, so that as seen from Earth the planet appears to make five circuits around our night sky. Each of the 8 years in this Venus-cycle (discovered by the Babylonians and the Mayans) has its pattern, so that the phenomena we will be seeing in 2015 will be a repeat of what we saw in 2007, and one we will see again in 2023. Venus passed superior conjunction (appearing to go behind the sun as seen from Earth) back on Oct. 25. Since then, it has been mired deep in the brilliant glare of the sun. Nonetheless, with each passing day, it has been moving on a slow course toward the east, and pulling slowly away from the sun's vicinity. And now Venus is getting ready for its evening ascendency as it has now begun climbing up out of the sunset glow in earnest. It will soon reclaim its role as the brilliant Evening Star, a title it has not held since the start of 2014. You can look for Venus with binoculars shortly after sundown very low in the southwest. In early December, the planet was just a mere 6 degrees high in the southwest at sundown (your clinched fist held at arm's length is roughly 10-degrees wide). At the time, Venus touched the horizon about 40 minutes after sunset. But during the middle and latter part of December, Venus gradually became easier to see. Continuing its swing east of the sun in late December, the planet should have become plainly visible in the western evening sky even to the most casual of observers, weather permitting. Venus, appearing as a brilliant silvery-white starlike object of magnitude –3.9 on the brightness scale used by astronomers, slipped below the horizon just over an hour after the sunset on Christmas Day. By New Year's Eve, it will have improved to more than 70 minutes. Viewed in the western twilight with clear weather, Venus should always appear dazzlingly bright to the unaided eye, and more so in binoculars. It will slowly rise higher each evening and will continue to grow in prominence all during the winter and on into the spring. 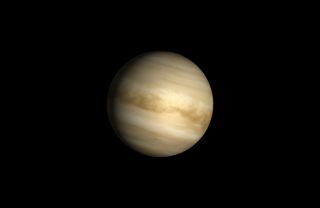 By April, Venus will also start becoming increasingly evident that the planet is making an unusual excursion into the deep night sky, setting more than 3.5 hours after the sun from late April through late May. Some astronomy books will tell you that it's impossible to see Venus in the middle of the night. So it will be hard to believe that Venus can stay up as late as it will during the third week of May, when it will be setting at 11:45 p.m. your local time. This will translate after midnight for observers stationed in cities like Pittsburgh, Raleigh, Dallas and Salt Lake City. And in the most extreme cases, it could be around 12:30 a.m. on daylight saving clocks in those cities that are far to the west of their standard time meridians! Venus reaches its greatest elongation — its greatest angular distance — 45 degrees to the east of the sun on June 6. On the evenings of June 30 and July 1, it will team with Jupiter in a spectacularly close conjunction high in the western sky at dusk. Venus will be at its brightest in early summer as it heads back down toward the sun, reaching its greatest brilliancy for this apparition on the evening of July 10 at magnitude –4.5. The planet should be most striking then; shining almost twice as bright as it does now. But with this final burst of glory, Venus will quickly fade, sliding back into the solar glare and vanishing from our view at the start of August. Between now and the beginning of August, repeated observation of Venus with a small telescope will show the complete range of its phases and disk sizes. Currently, Venus appears nearly full (it goes through phases like Earth's moon), and through the upcoming winter season will display nothing more than a tiny, dazzling gibbous disk. The planet will become noticeably less gibbous by the end of March. By early June, Venus reaches dichotomy (displaying a "half moon" shape). In July, the planet shows us a large crescent as it swings near the Earth. Indeed, those using telescopes will note that while the Earth-Venus distance is lessening, the apparent size of Venus' disk will grow, doubling from its present size by May 21. When it has doubled again in size on July 14, its large crescent shape should be easily discernable even in steadily held 7-power binoculars. But even after it passes inferior conjunction on Aug.15, the Venus show will not be over, for it dramatically reemerges as a dazzling "morning star" low in the southeast sky by month’s end. Then, a repeat performance will begin in September, with the above sequence of events reversed. It continues right through to the end of 2015. Indeed, without a question of doubt, 2015 will be Venus' year! Editor's note: If you capture an amazing photo of Venus, or any other night sky view, that you'd like to share with Space.com for a possible story or gallery, send in images and comments to managing editor Tariq Malik at: spacephotos@space.com.